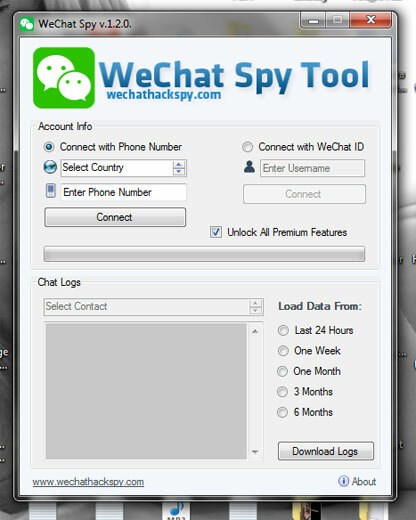 For last few weeks looks like my eyes only falling on this kind of software like WeChat hack tool is. And I’m not even surprised because there are already of bunch of messaging apps for mobile phones which list is never endless. From beginning stages when only WhatsApp existed now we have two-digit number of them for sure. Well for now let’s stick with this app I’m going to discuss about shall we. As you can see above, it’s possible to connect to someones account in two different ways. By entering victims phone number and by their WeChat username they’re used when signing up for an account. Whatever choice you go for, app will do its job successfully. Connecting time last for about 1-5 minutes, depending on how protected WeChat’s databases “silo” section is. Because they have multiple silos with stored information inside, users private data are distributed in several of these. And each one has different level of protection. Once you’re connected to chosen account, you have all freedom and options there to manipulate with like it’s your own account! You can send messages and text with other contacts, remove or update profile picture or status messages and everything else. Really interesting isn’t it? You can find it at wechathackspy.com post where I also discovered this application first time. It works on smartphones (Android & iOS) and desktop devices (Windows & Mac). Because of nature of this program (hacking tool) I made next term to keep myself protected in legal way. I don’t want be responsible not blame myself if someone use this software for any illegal activity and I don’t want anyone to claim they’ve learned that information here. – You’re only allowed to use is as a parental monitoring solution to supervise children’s mobile phones activity in aim to protect them against online criminal. You held any risks if you use it in any different way then this one.